Ovviamente tenendosi a milano, non poteva mancare tra le menti il mio amico Davide aka Folletto Malefico. Mi dispiace non saro presente ma nn vedo l’ora di vedere cosa saltera fuori. Couple of years ago I tried to write something in prolog. I thought about doing the classical syllogism about Socrates (the one about mortality) but in a sudden illumination I wanted to recreate a classical sketch from the movie Monty Python and the Holy Grail (1975). So the requirements to “get” the jokes are that you are a geek, and that you love the Pythons (which is a syllogism by itself). Knowing some Prolog doesn’t hurt. witch(X)  :- burns(X) , female(X). 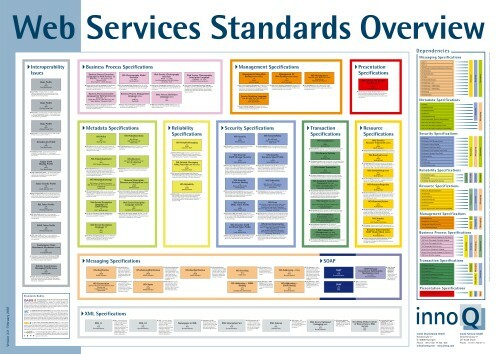 A nice PDF poster with all gazillion WS standards. They can even send it to you for the price of shipping. More info here, courtesy of innoQ. Yes, now I’am a fonero. Imified is an instant messenger bot that works on the AIM, MSN, GoogleTalk/Jabber (Yahoo IM currently offline) networks and offers access to a growing number of web applications (WordPress, Blogger, GoogleCalendar, MovableType and others), as well as productivity tools like notes, reminders, and todo’s.Â Pretty slick. Every time I see something innovative and creative as this I get the urge to take my degrees and throw them in the trash. Only thinking outside the box can take us to another level of human to computer interaction. The good news is that it seems that we’ll see some frameworks on the desktop that will allow us to do similar stuff as well (WPF, Core Animation, Flash). I own a Radeon X1600, it’s a medium priced/performance card from ATI that belongs to the X1000 family and whose driver support is coming up gradually since last year. I’ve been waiting for the new drivers that should be out this year with the support for AIGLX for quite some time now and I said to myself enough is enough. I already knew that XGL was a quick and dirty fix and the latest drivers don’t hide that they contain some support for it so I said to myself “what the heck, let’s try this sucker”. I’ve tried it several times before but it always failed. This time however, bingo, following the XGL Gentoo HOWTO things went smoothly, even Beryl installed quite well. I suppose because finally things were getting more stable and official. All I can say is… Wow. Check your knowledge of the GoF design patters by doing this crossword puzzle. You are currently browsing the SigmaLab blog archives for March, 2007.